As a kid growing up in Lane County, Nancy Bray earned summer spending money picking beans in area farm fields. "I became aware that there were families out there picking for their basic needs," she says. Bray volunteered with the Migrant Ministry while in high school. Later, at the UO, she boycotted the EMU for serving non-UFW union lettuce. Since graduation, she has taught in Springfield schools for 30 years. When she began teaching English Language Learners in the mid-90s, one of her first bilingual assistants was Guadalupe Moreno, recently arrived from Baja California. "I had two years of English classes at LCC," says Moreno. "I was lucky to get the job and help the Latino community." 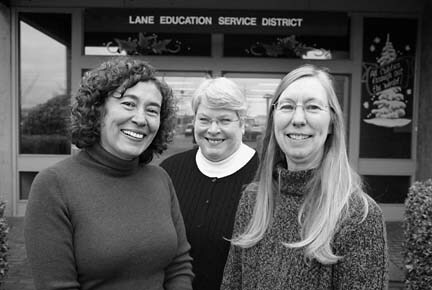 Since 2003, Bray and Moreno have worked together as director and coodinator of the Lane Education Service District's Migrant Education Program, providing educational and social service support to children of migrant workers. A native of Winston, Oregon, Renee Damon has served seven years as program assistant for the MEP, managing the paperwork to satisfy state and federal regulations.